Since 1981, October has been designated as Domestic Violence Awareness Month. Domestic Violence is a problem that cuts across all religious, cultural, racial, social, and economic class lines. The color of Domestic Violence Awareness Month is purple – many people wear purple ribbons to remember the victims of private violence, where it takes place behind closed doors. Here is the text of a proclamation by President Obama about Domestic Violence Awareness Month and why it is so important to consider this issue carefully in every family and every community. 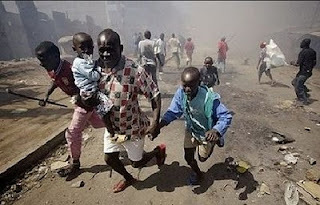 Family flees election-related violence in Kenya. The prophet knows that evil is a problem. The psalmist knows that the wicked “will soon fade like the grass” (Psalm 37:2, NRSV). The prophet knows that “do not fret” is not an adequate response to those who have suffered the trauma of injury and injustice. Even if the wicked will fade, they are here now, and they are all too strong. “Destruction and violence are before me;... The wicked surround the righteous” (Habakkuk 1:3,4, NRSV). The prophet cannot rest. What he sees afflicts him, and his unanswered cries for help cut as painfully – maybe more so – than the suffering he witnesses. One of the central features of current controversy over the Park 51 Islamic community center is the public debate over what constitutes “holy ground.” This is held to be an essential part of understanding and remembering what happened on 9/11/01. Unsurprisingly, the public debate is most intense at the World Trade Center. It was the first and focal point of the 9/11 attacks, and the first and focal point of public attention. It had the “most seen” images of that day, it is the real estate most familiar and most valuable, and of course, it is the location of the greatest number of victims.